You are welcome to join our easy-paced bike rides. Click here for all the information you need. Our regular monthly rides invariably start on Middle Meadow Walk. But we occasionally organise additional runs, and these sometimes start from an alternative meeting point in Craigleith. If you are not sure how to find that point, read on. The Craigleith meeting point is at the junction of three bike paths: the Roseburn, Blackhall and Telford Paths (see photo). It is 1.8 km (just over a mile) north west of the start of the Roseburn Path in Russell Road. As you approach from that direction, you will pass under Queensferry Road. You will then see a Sainsbury petrol station through the trees on your right. 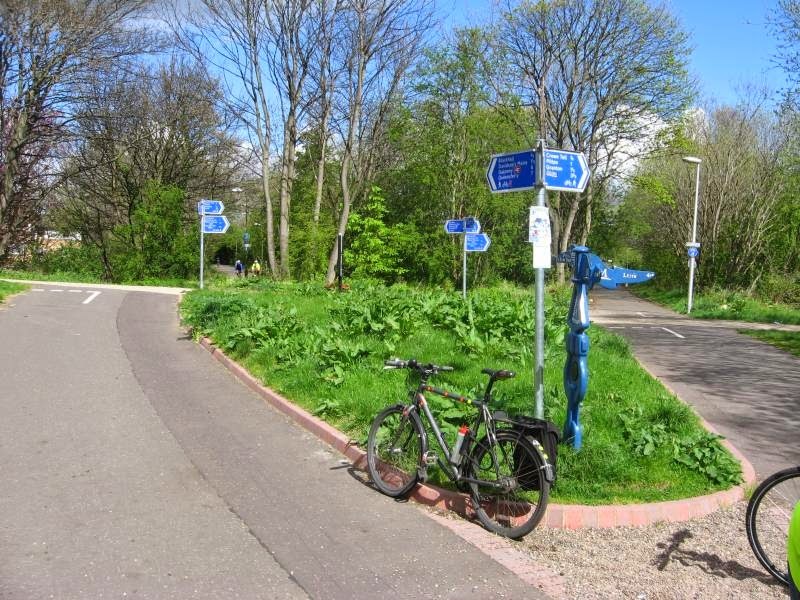 There is a Sustrans marker at the path junction, as well as several signposts and information boards. If you are still not sure where it is, look up South Groathill Avenue in any street map. This is a small road that runs alongside the Craigleith Retail Park. To reach the meeting point from there, look for the signposted access to the bike paths, next to a lights-controlled crossing. The grid reference of the meeting point is NT 233 747. On the Spokes Edinburgh map, the reference is G9. Edinburgh 20-Milers is an informal and sociable cycling group. We have an easy-to-moderate ride on the second Saturday of every month, and other occasional rides throughout the year. We favour easy paths and gentle gradients where possible, and aim to avoid heavy traffic. We meet on the second Saturday of every month (January to December) at the north end of Middle Meadow Walk (at the junction with Lauriston Place) in Edinburgh at 10.30am. All our rides are free. There's no advance booking: just turn up on the day. Got a question about our rides? See our information page, or email us at 20milers@gmail.com. These are some of the places where we stop for food and refreshment on our rides. For details of other organised rides in Edinburgh: see the Cycling Edinburgh site.